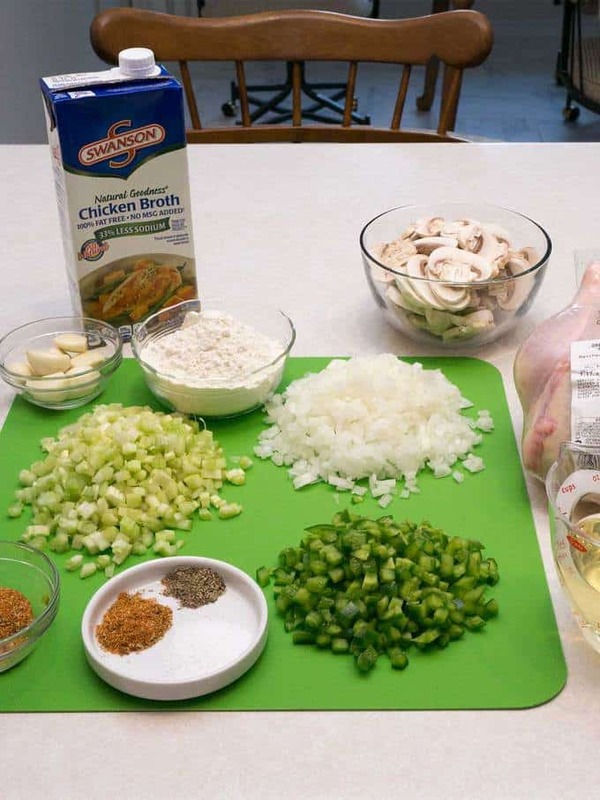 Chicken Fricassee is really a French stew that is typically cooked in a white wine sauce. 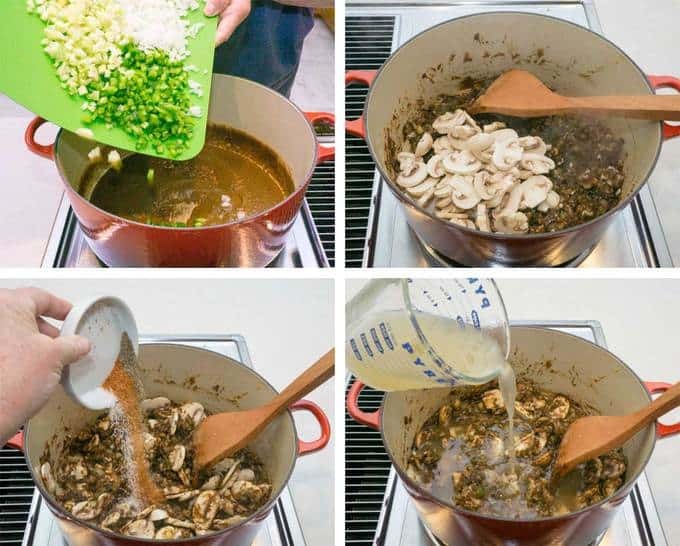 This recipe is the Cajun version that is made with a traditional roux, and contains the holy trinity highlighted with Cajun seasonings. It’s easy to make and incredible to taste! When Susan and I were in New Orleans, we attended a cooking demonstration. The cooking demonstration included Cajun Chicken Fricassee. 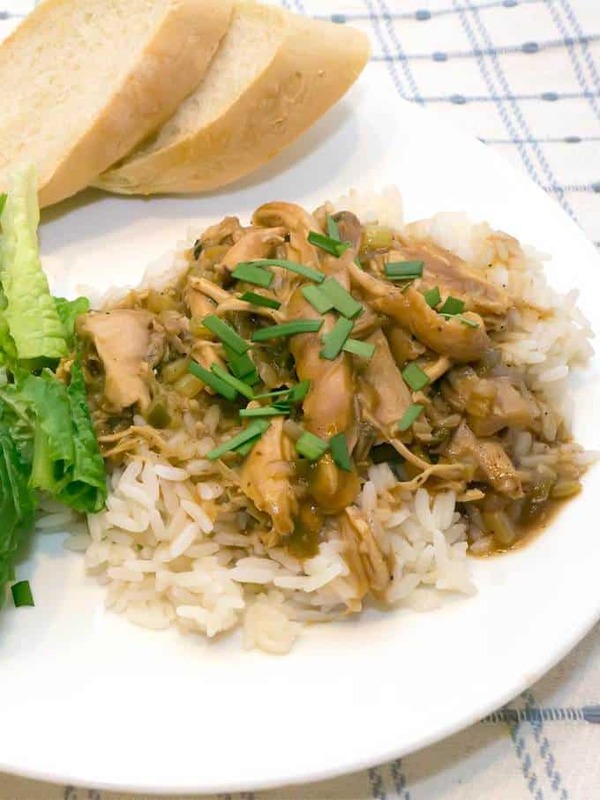 Given that Mardi Gras season is starting up, I thought that it would be fun to focus on Mardi Gras themed foods, starting with the Chicken Fricassee. Ingredients for Cajun Chicken Fricassee. I used the following ingredients: Chicken, Cajun seasoning, vegetable oil, all-purpose flour, onion, celery, bell pepper, garlic, mushrooms, chicken broth, salt and freshly ground pepper. For the Cajun seasoning, I used Emeril’s Essence. Because of the high heat, I used peanut oil. I knew that olive oil and other low heat oil would not work here. As a first step, I removed the backbone from a whole chicken using kitchen shears, and cut the remaining chicken in half. After patting the chicken dry with paper towels, I coated both sides of the chicken halves with 1 Tablespoon of Cajun seasoning. Next, I heated 1/4 cup of peanut oil in a Dutch oven over medium high heat, and added the chicken. I browned the chicken on both sides, and removed it from the Dutch oven. This took about 5 minutes. Finally, I added the remaining 1/2 cup of the peanut oil and the flour to the Dutch oven. I started stirring it constantly over medium high heat. As an aside, Roux actually has four different stages. The first is white roux that is the basis for Béchamel sauce. The second is a blond roux that is a light, golden-brown shade with an aroma resembling popcorn or toasted bread. The third is a brown roux that resembles the color of peanut butter. It has a more pronounced and sharper aroma than the nutty smell of blond roux. 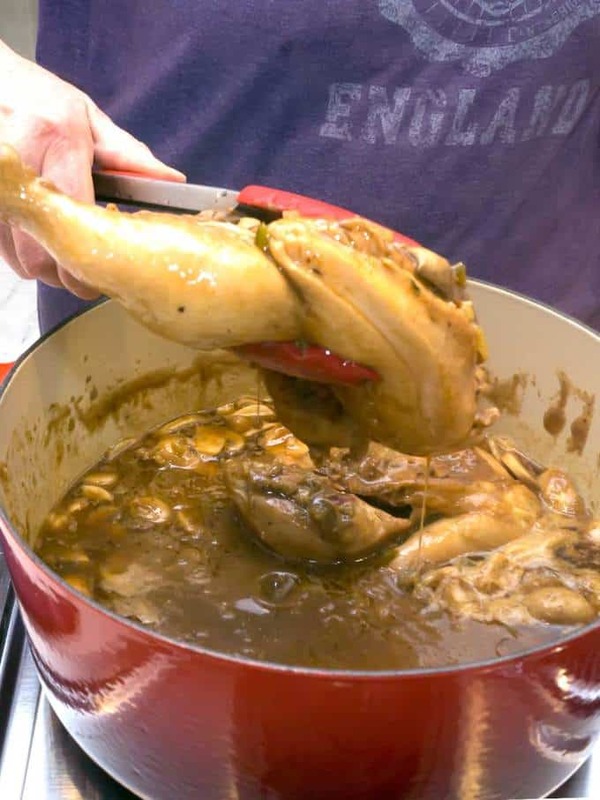 When roux reaches the brown stage, the flour begins to lose its thickening power and starts to separate from the oil. The final stage is dark brown roux, with a color resembling Nutella. Its aroma is more mellow than the strong, roasted flavor of brown roux. This stage has the least thickening power of all four, and its main purpose is as a flavoring agent with thickening being secondary. I cooked the roux for the Chicken Fricassee to the dark brown stage. I used my roux paddle that I purchased in New Orleans to constantly stir the flour and oil. The consistency of the roux was like a pancake batter. After about 5 minutes, the roux reached the blond stage, signaling that it was time to lower the heat to medium. I continued to cook the roux, stirring constantly over medium heat until it reached the dark brown stage. At this point, the roux was the color of Nutella. This took about 10 minutes. Working quickly, I added the onions, celery and bell pepper to stop flour from cooking any more. Still using the roux paddle, I stirred the mixture ensure that the vegetables were well incorporated into the roux. I cooked this mixture for about 5 minutes. Then, I added the garlic and cooked it for about 30 seconds until it was fragrant. Next, I added the mushrooms and the remaining Cajun seasoning, salt and pepper. I continued cooking the mixture, stirring occasionally, for another 5 minutes. After 5 minutes, I added the chicken broth. Finally, I returned the chicken to the Dutch oven. I covered the pan, and simmered the chicken over low heat for about an hour, until the chicken was well cooked and starting to fall off the bone. At this point, I removed the chicken from the Dutch oven. I removed the skin and bones from the chicken, and returned the chicken pieces to the sauce. 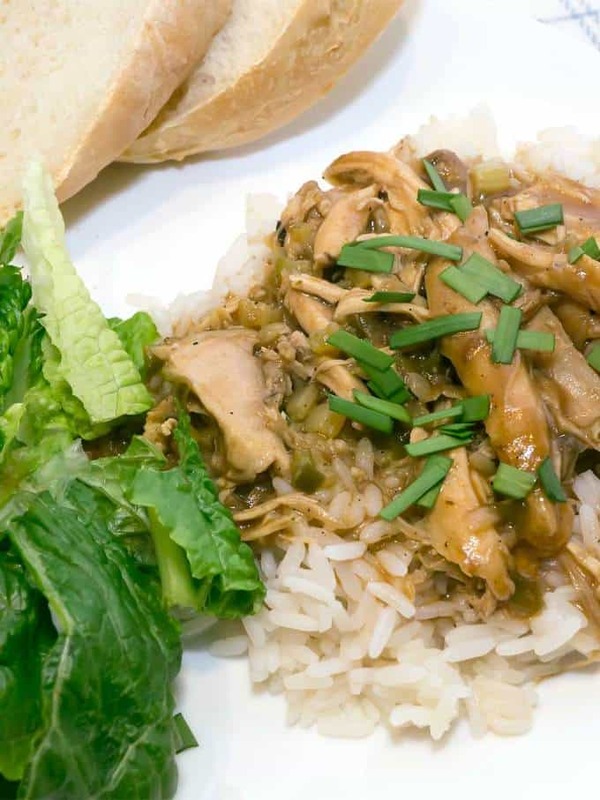 Once everything was well heated, I served the Cajun Chicken Fricassee over white rice, along with a Caesar salad and a home-made baguette. Yum! Chicken Fricassee is really a French stew that is typically cooked in a white wine sauce. This recipe is the Cajun version that is made with a traditional roux, and contains the holy trinity highlighted with Cajun seasonings. It's easy to make and incredible to taste! Pat chicken dry with paper towels. Coat both sides with 1 Tablespoon Cajun seasoning. Heat 1/4 cup vegetable oil in a Dutch oven over medium high heat. Add chicken; brown on both sides. 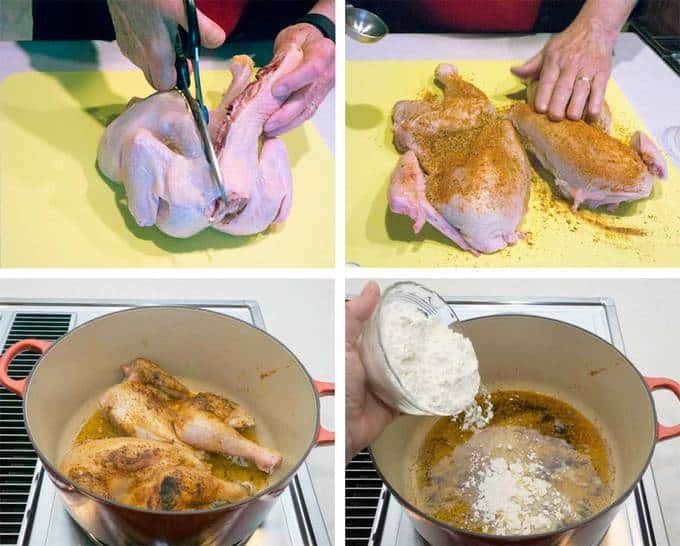 Remove chicken from Dutch oven. Add remaining 1/2 cup of oil and flour to Dutch oven over medium high heat. Stir constantly with roux spoon or other type of wooden spoon until mixture reaches blond or light brown stage, about 5 minutes. Reduce heat to medium and continue to cook the roux, stirring constantly until it reaches the dark brown stage, about 10 minutes. Watch carefully because the roux will quickly burn at this point. Add the onions, celery, and bell pepper to the roux; stir to combine. Cook over medium how heat stirring occasionally, until creamy, 5 minutes. Add the garlic; cook for 30 seconds, and then add the mushrooms and remaining Cajun seasoning, salt and pepper. Stir; cook 5 minutes. Increase the heat to medium high. Add the chicken stock; cook stirring constantly until mixture thickens. 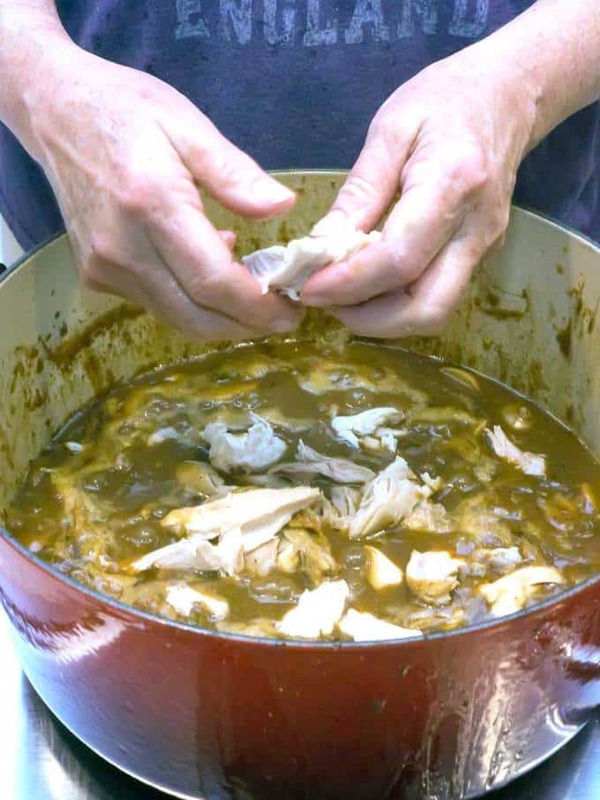 Return chicken to Dutch oven. Reduce heat to low; cover Dutch oven and simmer for 1 hour, or until chicken is fork tender and beginning to fall off the bone. Remove the chicken from pan. Remove the skin and bones; discard. Shred chicken; return to Dutch oven. Heat 5 minutes or until heated though. Serve over rice. Yield: 6 servings. Note: Do not use plastic or silicon spoon or spatula. Because of the high heat, either may melt.